USB Power Socket Size: about 50x36.5mm. Panel Size: About 105x45x55mm. Install Hole: 29mm. Color: Blue. Thickness:15 mm. 4 X Screws. The Super Slim design allows for easy fitting while the glass front adds a professional and cool look! (see picture below). Suitable for any 4,6 or 8 cylinder vehicle! •Colour : 7 Colour Multi-function for back-light. (Installation of water temperature need to add Water Temperature Adaptor Three Direct (not included). Installation of water temperature need to add Water Temperature Adaptor Three Direct （not included). Oil pressure sensor thread：NPT8/1. water temperature sensor thread:10MM. Fuel gauge cable m ust connect with Resistive Induction sensor(only work with this kind sensor). 1 oil pressure sensor. Temperature range:-20-150C. 1x Cigarette Lighter Socket. Twist-and-Lock locking socket, allows a suitable power plug (not included) to lock into place. USB Socket Power Output: DC 5V 1A / DC 5V 2.1A. Material: High Quality Nylon Plastic Socket Body. Universal fit for 12v 24 power car truck etc. Water temperature display range(-10-120C). water temperature sensor14mm. Size: 10x5.6cm. Universal Car Seat Seam Wedge Cup Drink Holder Seat Wedge Cup Holder Mount 1x. Fuel gauge cable must connect with Resistive Induction sensor(only work with this kind sensor). Oil pressure sensor thread:NPT8/1. 1 oil pressure sensor. Temperature range:-20-150C. Water temperature sensor thread:10MM. Function Type: Turbo Boost gauge (for turbo cars). 1 x Turbo Boost Gauge. Adjustable alarm level;. 1 x Power Parallel Cable. Colour: Black. 1 x Sensor. 1 x Adapter. We will reply you within 24- 48 hours. Oil Pressure sensor:1/8 NPT. Emperature sensor screw : M10. 1x Gauge set. Suitable for Car,Motorcycle or by your need! Working temperature: -40 - 50℃. Product size: 9.5x6.3x3.2cm. Included gauge holder, sensor and wires, easy to install. 7 color LED digital display, high accuracy data reading. Model: Oil Pressure Gauge. Light Color: 7 Color. 1 Set of Accessories. Color: Black. Display specifications one 0.36LED digital tube (red). Hole size hole spacing: 28mm aperture: Φ2.8mm. Input impedance> 50KΩ. Test accuracy ± 3 ‰> 10V error plus or minus 0.2V <10V positive and negative 0.03V. Oil pressure sensor ： M14 x1.5;. Universal fit for 12v 24 power car truck etc. Size: 10x5.6cm. Rubber 1.5M 2X Wheel Arch Trim Fender Flare Wheel Eyebrow Protector trim Strip. Pls make sure you are capable to make refit with this product. Range:5~15V DC. Input:12V DC. Product use range:Cars, motorcycles, other general models. We will reply you within 24- 48 hours. Water temperature display range(-10-120C). water temperature sensor14mm. Universal fit for 12v 24 power car truck etc. Size: 10x5.6cm. We will reply you within 24- 48 hours. 2 Functions in 1. Pls make sure you are capable to make refit with this product. Top speed 999 MPH. Settings for MPH, Nautical MPH or KMH. This unit works on most of motorcycles. Great for Auto, truck, ATV/UTV, Motorcycle or marine applications. White Backlight. Strong internal antenna. Sunshield design for better display. 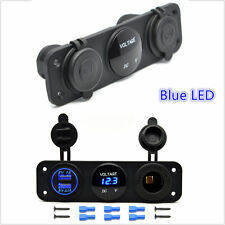 New 8258 Car Radio 1Din Bluetooth LED Display Stereo MP3 Music Player FM AUX USB. Black Car Vehicles Mini Air Bag Simulator Bypass Garage SRS Fault Diagnostic Kit. Digit: 3 Digit. Oil Pressure sensor：1/8 NPT. 1x Oil Pressure sensor. Power cable length : approx.50cm. Suitable for Car,Motorcycle or by your need! Ambient temperature: -10℃-50℃. Red --- power . (Red black) --- power -. Oil Temp Gauge. 1 x Oil Temp Gauge. Included gauge holder, sensor and wires, easy to install. 7 color LED digital display, high accuracy data reading. 1 x Set of Accessories. We will reply you within 24- 48 hours. Auto Car Headlight Glass Liquid Ceramic Coat 30ML Anti-Scratch Sponge Tool Kit. Fuel gauge cable m ust connect with Resistive Induction sensor(only work with this kind sensor). Oil pressure sensor thread：NPT8/1. Black Car Vehicles Mini Air Bag Simulator Bypass Garage SRS Fault Diagnostic Kit. 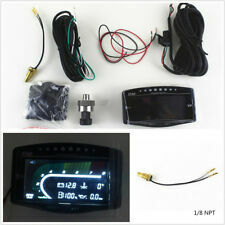 New 8258 Car Radio 1Din Bluetooth LED Display Stereo MP3 Music Player FM AUX USB. Oil Pressure sensor:1/8 NPT. 1x Oil Pressure sensor. Settings for MPH, Nautical MPH or KMH. Top speed 999 MPH. Great for Auto, truck, ATV/UTV, Motorcycle or marine applications. This unit works on most of motorcycles. White Backlight. Strong internal antenna. Oil Pressure sensor：1/8 NPT. 1x Oil Pressure sensor. Suitable for Car,Motorcycle or by your need! Ambient temperature: -10℃-50℃. Power cable length : approx.50cm. Red --- power . (Red black) --- power -. Universal Car Seat Seam Wedge Cup Drink Holder Seat Wedge Cup Holder Mount 1x. OBD2 ELM327 Bluetooth Car Auto Fault Diagnostic Scanner Tool(no wifi,not fit iOS. Chip & Crack Car Windshield Window Glass Scratches Professional DIY Repair Kits. ). USB Power Socket Size: about 50x36.5mm. Panel Size: About 105x45x55mm. Color: red,green,orange. Color: Red. Thickness:15 mm. Color: Black. Install Hole: 29mm. We will reply you within 24- 48 hours. Fuel gauge cable must connect with Resistive Induction sensor(only work with this kind sensor). Oil pressure sensor thread:NPT8/1. Temperature range:-20-150C. 1 oil pressure sensor. Water temperature sensor thread:10MM. 7 color LED digital display, high accuracy data reading. Model: Oil Pressure Gauge. Included gauge holder, sensor and wires, easy to install. 1 Set of Accessories. Light Color: 7 Color. Color: Black. Oil Temp Gauge. 1 x Oil Temp Gauge. Included gauge holder, sensor and wires, easy to install. 7 color LED digital display, high accuracy data reading. Made of high quality plastic shell, durable, shockproof and corrosion resistant. Oil Pressure sensor:1/8 NPT. Power cable length : approx.50cm. 1x Oil Pressure sensor. Ambient temperature: -10℃-50℃. 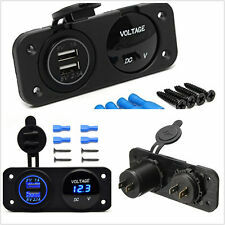 Suitable for Car,Motorcycle or by your need! Temperature Sensor Screw:M10. 1 Set Cable. Let you always monitoring the health of battery and peace of mind when drive; It's a subtle blue light, allows you easy find the device in dark; Moreover, it also can check whether the connection is successful. 12V Durable Filter Electric Silica Gel Heating Ring Mat For Car Parking Heater. 12V Silicagel Filter Electric Heating Ring Mat Pad for Air Diesel Parking Heater. 1 x Volt Gauge. 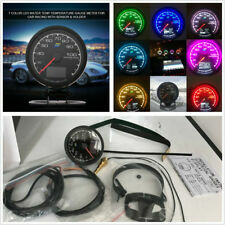 7 Color LED Through Dial Lighting with Color Recall Ability. Display mode: LED digital tube. Mini size with 3-digit LED Digital Display. Display color: Blue. We will reply you within 24- 48 hours. Car Tire Studs Screw Snow Spike Wheel Tyre Snow Chain JX8 Tire Nail Air Gun Tool. Black Aluminum Oil Catch Can Reservoir Tank 300ml Breather Filter Oil Separator. 12V 75W AC Xenon HID Ballast Quick Start for Car Headlight Bulbs H9 H10 H11 H13. Universal Car Seat Seam Wedge Cup Drink Holder Seat Wedge Cup Holder Mount 1x. 2PCS WHEEL ARCH GUARD TRIM / WHEEL ARCH PROTECTOR UNIVERSAL SOFT RUBBER BLACK. OBD2 ELM327 Bluetooth Car Auto Fault Diagnostic Scanner Tool(no wifi,not fit iOS. ). Water temperature display range(-10-120C). water temperature sensor14mm. Universal fit for 12v 24 power car truck etc. Size: 10x5.6cm. Pls make sure you are capable to make refit with this product. We will reply you within 24- 48 hours. Fits for most 12-24V Boat Marine Vehicle Motorcycle Truck ATV UTV Car Camper LED Round Panel. Say Goodbye to Exhausted Battery Before Each Drive! CE Certification,High temperature resistant,it well protects the whole circuit. 7 color LED digital display, high accuracy data reading. 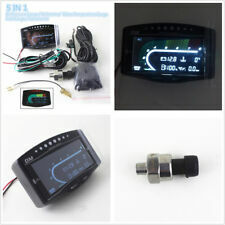 Included gauge holder, sensor and wires, easy to install. Model: Oil Pressure Gauge. Light Color: 7 Color. Color: Black. White Wire - ACC. Black Wire - Battery Negative Pole. Digit: 3 Digit. Oil Pressure sensor：1/8 NPT. Power cable length : approx.50cm. 1x Oil Pressure sensor. Suitable for Car,Motorcycle or by your need! Ambient temperature: -10℃-50℃. Red --- power . (Red black) --- power -. Fits for most 12-24V Boat Marine Vehicle Motorcycle Truck ATV UTV Car Camper LED Round Panel. New Blue & Grey Microfiber Car Cleaning Sponge Window Wash Mitt Polishing Pads. Breathable Linen Fabric with Black Trim Interior Protection Car Seat Cover Sets. Super large input of up to DC 60V with Over-current， Over-volt and Short Circuit Protection, well protects the whole circuit, fits for most 12-24V Car Motorcycle ATV UTV RV Vehicles and Marine Boat. Say Goodbye to Exhausted Battery Before Each Drive! Smoke Tint Lens, Red Illuminated Needle，clear and bright LED Display during the night.LED super bright display. (The compatibility just for reference. Racing look enhance the characteristic to your car. ). When the alarm that is displayed flashing alarm. Oil Pressure sensor：1/8 NPT. 1x Oil Pressure sensor. Emperature sensor screw : M10. 1x Emperature sensor. Ambient temperature: -10℃-50℃. Power cable length : approx.50cm. Oil Temp Gauge. 1 x Oil Temp Gauge. Included gauge holder, sensor and wires, easy to install. 7 color LED digital display, high accuracy data reading. 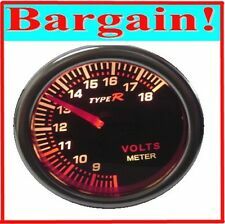 2x Flowing Motorcycle 12 LED Turn Signal Indicator Light Yellow Turn Lights. This unit works on everything! It's very quick and easy to install on any kind of vehicle as long as you have external power (12-24VDC) from battery or alternator. 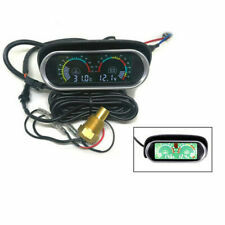 • This gauge features Fuel level, Oil Pressure, Water Temp.